As summer kicks off what’s a girl to do? We want to look fabulous but we also want to be comfortable. Finally there is a perfect solution. Breathable, lightweight ‘on trend options’ for the warmer weather. With barbecues, pool time and picnics there is no need to stress over your tresses. Our private studio will show you how simple this and other options can be. Now you can keep your focus on the fun stuff like making the perfect Lemonade or Potato Salad. Bring a small pot of salted water to a boil. Add potatoes; cook until tender but still firm, about 15 minutes. Drain and cool. Place eggs in a saucepan, and cover completely with cold water. Bring water to a boil. Cover, remove from heat, and let eggs stand in hot water for 10 to 12 minutes. Remove from hot water, and cool. Peel the eggs and cut around the egg white; keep the yolk whole. Dice the egg whites and potatoes. Combine in a mixing bowl and add the salad dressing. Toss the potatoes and egg; crumble the egg yolk on top and serve chilled. Synthetic Hair or Human Hair, which is right for me? Synthetic Hair verses Human Hair in both wigs and pieces. Before I share the options and pros and cons in each direction, my first question to you would be why are you considering alternative hair options? There is no cookie cutter approach and no one right answer. Is it because of chemotherapy or other drugs that you may experience thinning or total hair loss which in many cases can be temporary? Or is it permanent (some medical conditions or different kinds of alopecia’s)? Or is it simply a wardrobe accessory? Defining how long you will be wearing hair is important. 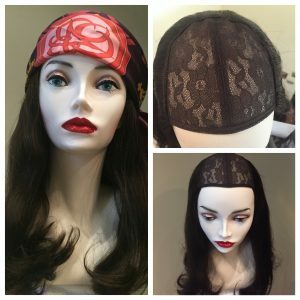 Human hair wigs or hair pieces last much longer then synthetic options. One good quality human hair wig can out live up to four synthetic wigs depending of course of quality and care. 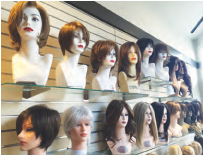 Synthetic wigs are in most cases less expensive and wash and wear. There is not much styling needed, making it not only quick and easy but also fun. Rain or humidity has little effect on it. The downside is it is not radiant heat durable which means if you like to spend time in the kitchen preparing your favorite pastas and soups over the stove top or opening the oven door; this is definitely not a good choice for you. Human hair wigs and hair pieces are exactly that. Just like your own hair it is absolutely beautiful when you spend the time to blow dry and style it after each washing using good hair care products meant for your wig or hair piece. It takes both time and effort to get it looking the way you would like. Rain and humidity is not a human hair wig or pieces friend. Stepping out into the weather can make it look frazzled and will require restyling if you get caught in the elements but it is durable in the kitchen and long lasting. Answering these few questions will help us help you to narrow down the right hair for your lifestyle. Sometimes the best answer it to own a few different pieces to suite your mood. When you meet with us for your complimentary consultation you will have the chance to really experience what each type of hair looks and feels like. That is an option that we as a private salon can offer you. Your time with us is yours alone. Contact us at www.althairsolutions.com or call 203 987 5948 ext 1 to learn more about what we can offer you or a loved one.